UWM aims to support and value faculty and staff who are the heart of the University. Through this initiative, we embrace innovation, creativity and diverse perspectives within an inclusive environment for all faculty, staff and students. Established in 1995, the Chancellor’s Advisory Committee for LGBT+ Advocacy is a non-elected, standing committee devoted to improving climate and diversity by making recommendations related to current and proposed policies and practices that affect LGBT+ employees and students. The Chancellor’s Advisory Committee on Mental Health is charged with supporting the establishment of comprehensive mental health prevention and intervention efforts on the UW-Milwaukee campus; developing and recommending within the campus governance and administrative functions, policies for addressing mental health issues including mental health crises; and serving in an advisory capacity for the Chancellor and campus administrators and governance bodies in need of input regarding mental health issues on campus. The Chancellor’s Task Force on Sexual Violence Prevention, Reporting and Response is charged with providing a structure designed to help ensure UWM is doing all it can to prevent and respond effectively to sexual violence. This charge is important in the mission of ensuring a safe and secure environment for all members of our campus community. 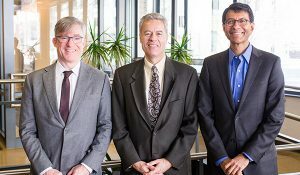 Rockwell Automation President and CEO Blake Moret and UWM Chancellor Mark Mone meet with ANSYS President and CEO Ajei Gopal. Rockwell Automation and ANSYS are key supporters of UWM's new Connected Systems Institute.